Indigenous artist Kurun Warun was born in Australia in 1966. He is a member of the indigenous Guntijamara tribe and is a descendant from Truganini, the last Tasmanian indigenous queen. Kurun Warun whose name means ‘Hissing Swan’ lives in the Noosa hinterland in South East Queensland. 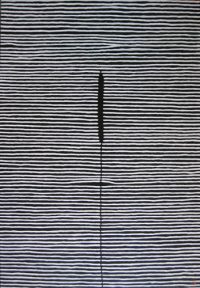 He is best known for his exceptional dot art and talent as a didgeridoo musician. He expresses his culture through art and music, and has won international recognition in these fields. Starting at just eight years of age, Tio has become a sought-after artist; his works now are valuable pieces of collectable aboriginal art. 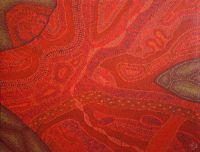 His aboriginal dot paintings have a traditional meaning which is not always immediately discernable, but within the colours, lines and space we are led through an underlying story. Kurun Warun also finds expression through traditional dance and music. Being an accomplished didgeridoo musician he has performed around the world in places as far flung as Italy and Korea. He played a role in the Sydney 2000 Olympic games as a traditional artist, has appeared on NBC in the United States and before Chelsea Clinton, former US president’s daughter. Michael Schumacher and Pierce Brosnan are recent acquirers of his works.